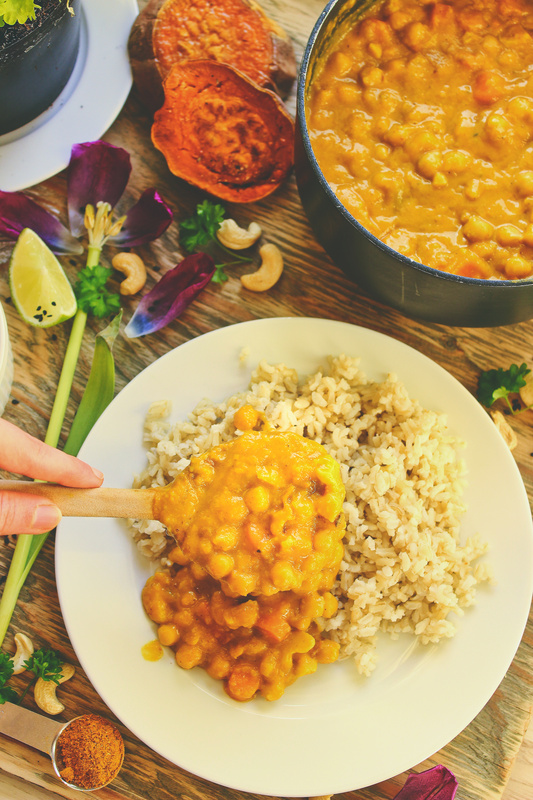 In this blog post, I’m sharing this sweet yellow curry recipe as well as some big news. 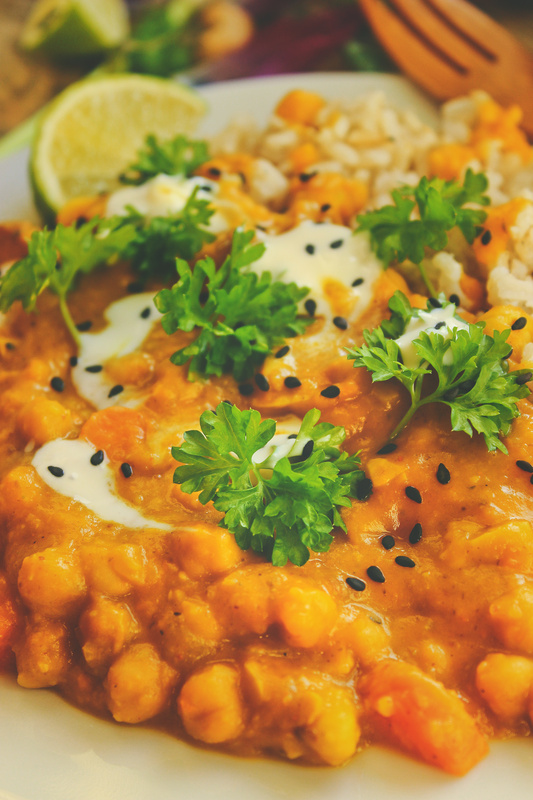 Onion, garlic, ginger, sweet potato, and coconut milk is blended into a creamy sauce in which carrots, chickpeas, cashew nuts, maple syrup, and lime juice are simmered in for a rich flavour and healthy fats. Served with rice, lime wedges, parsley, and yoghurt, it’s so comforting, filling, and nourishing! Another long time, no see. I love blogging, but I’m dealing with personal problems which make it hard for me to commit to it. And I’m not going to dwell on it since I write about in every blog post… Instead, I’m going to focus on something positive and totally unexpected. 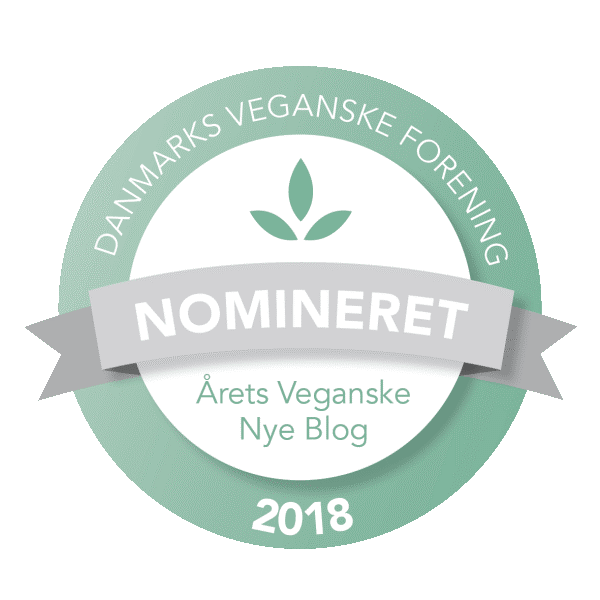 I have been nominated for an award (New Vegan Blog of the Year) by the vegan society in Denmark! It’s surreal. I honestly can’t believe it. When I started this blog, I didn’t think anyone would see it. I thought, Google is so big, no one ever sees someone so small. For someone to actually suggest my blog to be a candidate for this reward, and for Danmarks Veganske Forening to choose me is quite frankly unbelievable. I don’t even think I deserve it, to be honest, but it’s happening nonetheless. I didn’t even know it was happening until yesterday when my dad saw my name on their website. It’s an honour, and I’m happy to even have been nominated. It’s more than I could have ever imagined! Back to this curry. I created this recipe a while ago. My inspiration for it came from a meal I tried from one of Simple Feast’s meal boxes. 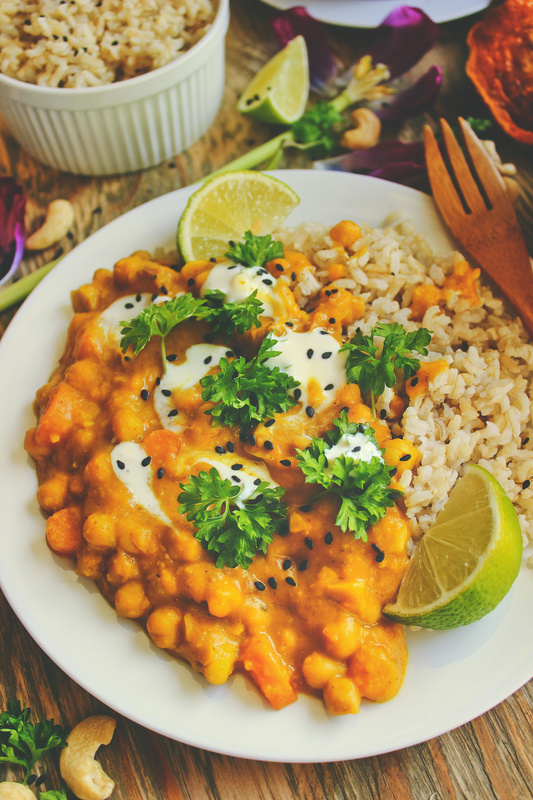 I really liked their curry and wanted to try to make my own version of it! 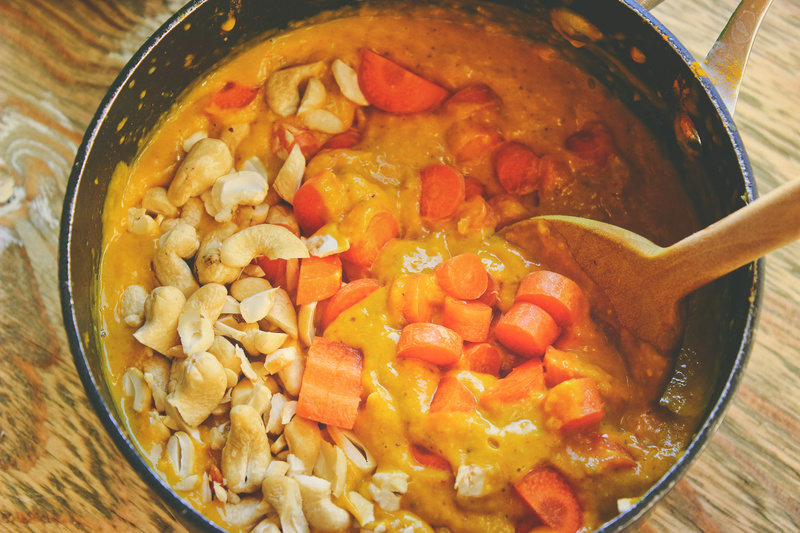 And then I randomly got the idea to blend sweet potatoes into a curry sauce for more flavour and creaminess. Needless to say, it worked really well. Since then, I have wanted to shoot the recipe many times, but I never got around to it – until today. I’m just finishing my lunch (the plate from the photoshoot) as I’m writing this. It is really creamy. I love sweet potatoes – they’re so versatile. Sometimes I eat them for breakfast as toast with just nut butter spread on top. It’s addicting. 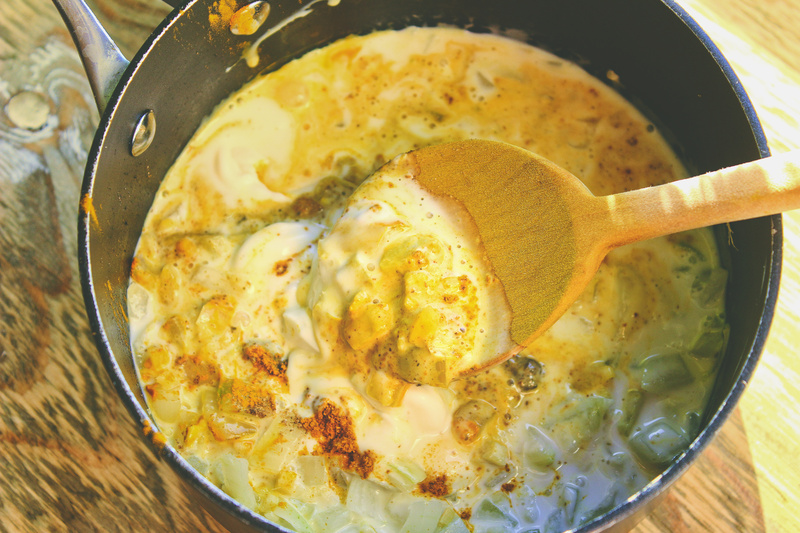 With the coconut milk, they make the perfect curry sauce and yellow colour! Another fact I can’t believe: it’s December! December has just kind of snuck up on me. I’m not really feeling the Christmas spirit, yet, but maybe I will once I have made myself some vegan risengrød (a Danish, simple rice porridge) and started experimenting with vegan ris á la mande (again, a Danish rice pudding traditionally made with whipped cream, which makes it not vegan for obvious reasons, but it will be when I make it!). And if I’m up for it, I might post how I make risengrød within the next couple of weeks. You might have noticed the new background in my pictures. My grandpa gave me an old piece of wood, and I love it. It’s a weird thing for a 15-year-old girl to love, but I’m not normal at all. Sauté the onion, garlic, and ginger in water or oil in a small pot over medium heat for 5-8 minutes, or until the onion is soft and translucent. 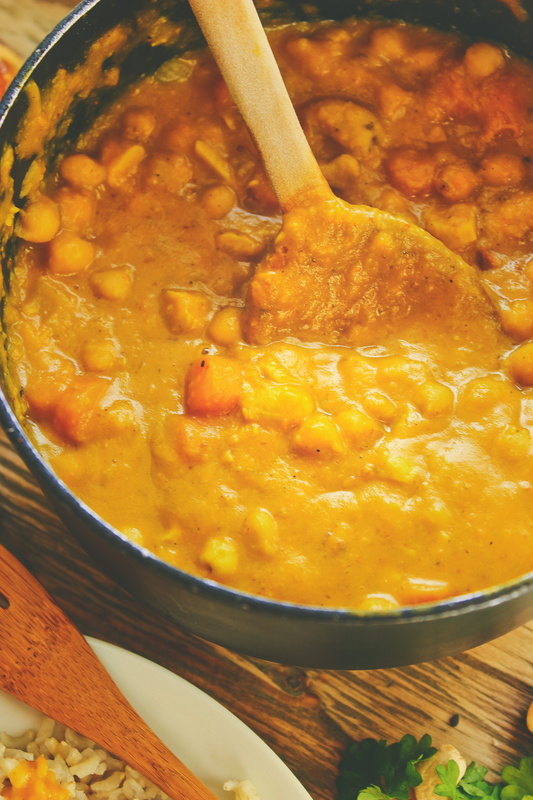 Add the sweet potato, coconut milk, water, curry powder, cumin, coriander, and turmeric and stir. Remove the pot from the heat and blend until smooth. I used an immersion blender, but you can use a regular blender. 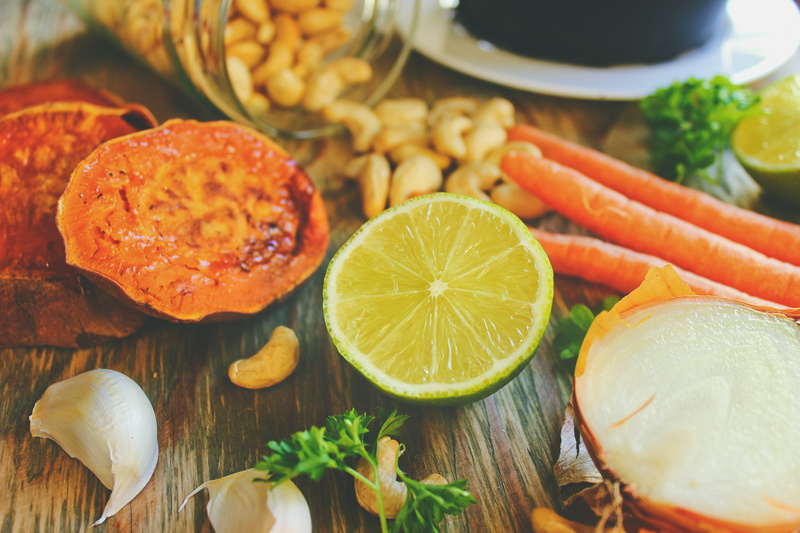 Return the pot to the heat and add the carrots, cashew nuts, maple syrup, and lime juice. Bring it to a boil. 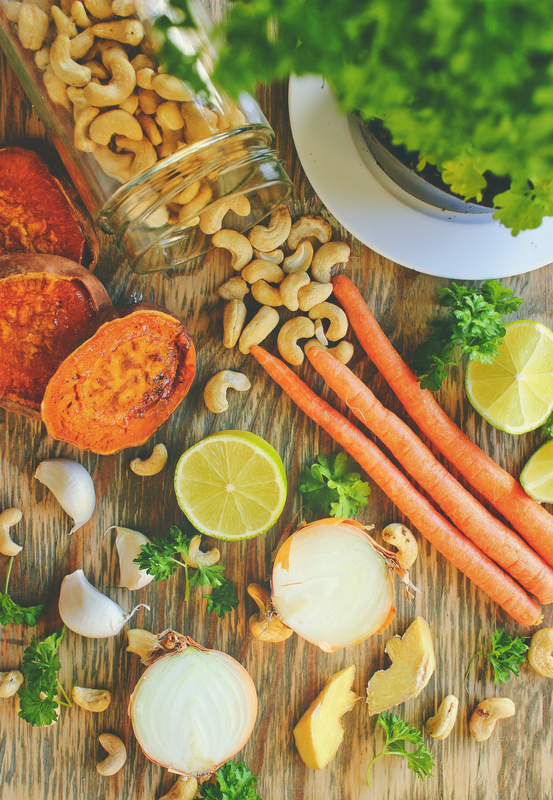 Once boiling, reduce the heat to low and let the sauce simmer uncovered for 10-13 until the carrots are tender and the cashew nuts are soft. Stir the chickpeas into the sauce and let them warm through. 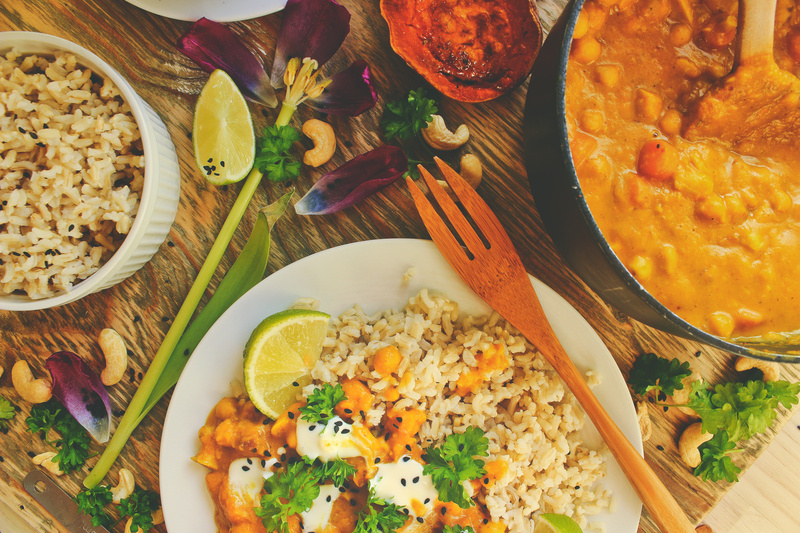 Taste the curry, add salt and pepper, and adjust any other seasonings to your liking. Add more curry powder for colour and spice, maple syrup for sweetness, or lime juice for tang. 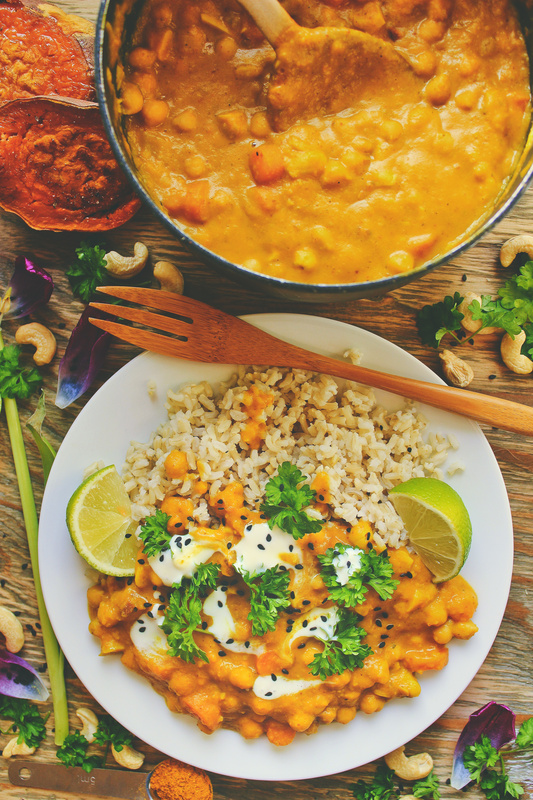 Serve the curry with rice, yoghurt, parsley, sesame seeds, and a squeeze of lime juice. 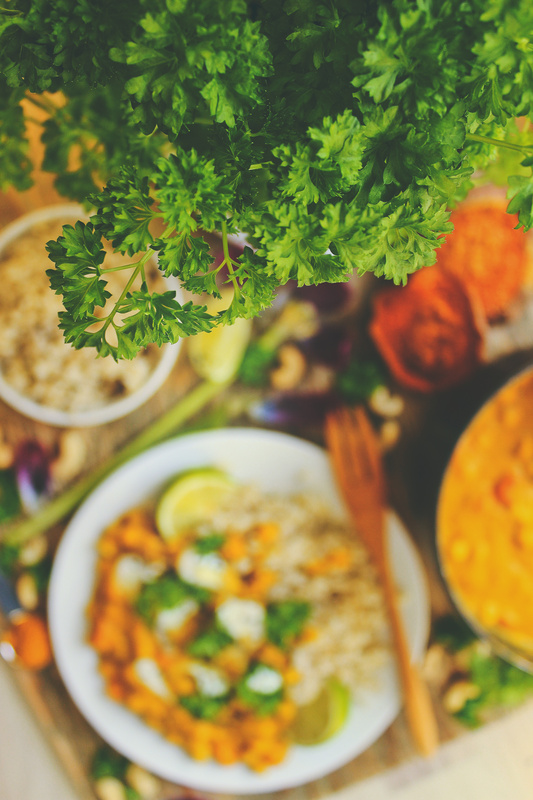 Store leftovers in the fridge for up to 5 days or in the freezer for 2-3 months. I didn't peel my sweet potato, but you can peel yours, if you'd like. (Otherwise you might have pieces of the peel in your curry - I don't mind them). I cut my sweet potato into rounds and baked them in my oven at 200°C (400°F) for about 30 minutes until they were tender. 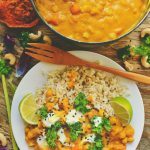 I'm a 15-year old passionate vegan, blogger, and photographer from Denmark. Beside cooking, working on my blog, and taking pictures, you can find me reading romance novels, cuddling with my guinea pigs, practising yoga, eating just baked sweet potatoes with nothing else, and trying to find my way on this journey that is called life.